Eleven BioRegion companies and projects have been chosen by EIT Health Spain to receive Headstart funding grants of up to €50,000 to accelerate their time-to-market and increase their chances of attracting private investors. In total, 15 companies have been selected from all over Spain. Among the selected are two projects in the CRAASH Barcelona acceleration program, organized by Biocat in collaboration with CIMIT (Boston) as part of the EIT Health Bootcamps program. These are Biel Smartgaze, a Catalan start-up that develops electronic glasses that use computer vision and virtual reality to improve visual perception for people with poor vision; and ABLE (Assistive Biorobotic Low-cost Exoskeleton), a project of the Polytechnic University of Catalonia (UPC) in collaboration with the Guttmann Institute to develop a low-cost, lightweight robotic exoskeleton to help people with spinal cord injury to walk. In addition to Biel Smartgaze and ABLE, other companies from the BioRegion that will receive the Headstart funding grants from EIT Health Spain include e-CARER, New Born Solutions, GlyCardial Diagnostics, ADmit Therapeutics, Anaconda Biomed, RemAb Therapeutics, FreeOx Biotech, Braingaze and HumanlTcare. 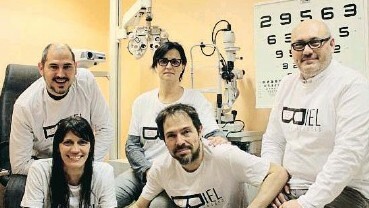 Selected from the rest of Spain are WIVI Vision, Spotlab, AptaTargets and ReHand. Among the finalists in the other nodes is the Irish submission, iBreve, a participant project in CRAASH Barcelona, which develops a wearable device that improves stress resistance by using machine learning to analyze the user’s breathing patterns. The semi-finalists in each node will pitch their projects at the European Health Catapult 2018 grand finale, which will take place as part of the EIT Health Summit being held in Lodz (Poland) on December 4 and 5. The winners of each category will receive prizes of between €10,000 and €20,000.